Everyday Finesse: I could hardly Bee--lieve it! Last Friday was my birthday and my husband and sister surprised me with a bee jacket and a few other bee supplies. I was SO surprised. You can't just go to your local five and dime and pick out things like these. In fact, they went to Buster's Bees in Jonesboro to pick out just the right fashion accessories I will need when our new hive of bees is available for pick up from the same place. When my husband asked what I wanted for my birthday I said, "It's not what I want but what I need. I really need some bee supplies." And that is how it started. They made a bee-line to the bee store to buy some lovely bee-wear! The estimated date we will have our bees is the second week of April and we will again make the trek to Jonesboro to pick up our new-bees. I am thinking I need some light-colored pants and shoes, maybe white or pale yellow. 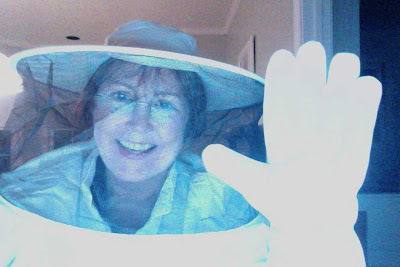 I don't know if the bees will care what I wear but I think I will be quite a funny sight when I suit up to check on our bees. I bee-lieve that is all, so I will bee-gone!